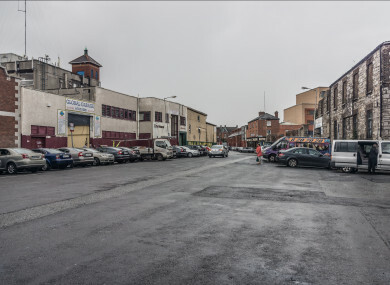 The Liberties’ Newmarket Square is primed for development – but some locals fear the outcome. FROM PETITIONS ABOUT ‘greedy developers’ to complaints over architectural merit, a plan to redevelop a once-overlooked quarter of the Liberties has locals drawing battle lines. In recent years, there has been a concerted effort to promote investment in the city’s inner south-west, with projects from new student accommodation blocks, hotels and several whiskey distilleries all unveiled. In July, three separate planning requests were sent to Dublin City Council to redevelop lands facing Newmarket Square. The plans, submitted by Newmarket Partnership, a company set up by Robin Simpson and Martin Creedon, involve wholesale changes in the area. The old structures would make way for several new buildings of up to six stories comprising offices, a hotel, apartments and a micro-brewery. The plans come as the capital heaves at the seams with acute housing and hotel accommodation shortages, and rapidly rising office rents fuelled by an appetite for space for growing businesses. When the plans were announced, the developers – who declined to be interviewed by Fora - were keen to point out how the area has “suffered significant neglect in recent decades”. The council’s Liberties local area plan makes clear in its overarching guidelines what is intended for the neighbourhood, which retains some of the city’s gruff, old-world charm. “Anything built within the Liberties should be distinctly Dublin,” the guidelines state – and many stakeholders don’t believe the new development fits that criteria. One petition, set up anonymously, has over 3,000 signatories calling to ”save Newmarket Square from greedy developers”. There have also been over 30 third-party observations sent to the council by Liberties residents and businesses, the majority of which object to some aspect of the planned new scheme. Recently, Dublin City Council said it had “concerns” about the new development, which it was not sure would “contribute positively” to the wider Liberties area. It requested more information before making a decision on the application. A lot of the complaints centred on the belief that the new buildings would clash with the area’s existing character. Architect George Boyle, who designed the nearby Teeling Whiskey Distillery, says she is not against developing Newmarket Square but labelled the look of the new buildings “insipid”. “We felt the recession has saved the Liberties from this generic development,” says Boyle, who also founded the formerly Liberties-based Fumbally Exchange. She says she had “electrifying” conversations with Creedon about how the area should be Dublin’s answer to Soho, and he seemed interested in the concept. “We wanted to weave in the historic industrial fabric of the area. That kind of industrial chic, if properly cultivated, can be turned into a great economic brand. This is the thing developers miss when they’re looking at the euro signs and the bottom line. Meanwhile, the project has many local businesses wondering if they have a future in a redeveloped Newmarket Square. Low rents during the recession attracted traders looking to pitch a stall, but those cut-price rates are unlikely to survive a major overhaul of the area. Several managers of local markets were quick to distance themselves from any campaign labelling the developers as ‘greedy’ for wanting to build in the neighbourhood. They are all hopeful they can negotiate a deal to stay. Sam Toland, secretary of the Dublin Food Co-op board, says the area has been “long overdue for regeneration” and it is quite “dilapidated” in parts. But there is no guarantee the three-decades-old group, which moved to the area in 2007, will keep its place in Newmarket post-development, and it’s already looking into possible new homes. Rents for the site have also crept back up in recent years after the landlords dropped their prices during the recession. Nevertheless, the Newmarket Partnership says rents remain “significantly below market norms” – at only €8 per square foot, compared to €40 elsewhere. A second petition, titled ”save the Dublin Flea Market” was created by the market’s organisers, and has attracted around 2,500 supporters. The developers say there is a provision in the development plans for more market space, but it is not guaranteed this component will be reserved for existing market-holders. Sharon Greene, co-organiser of the Dublin Flea Market, says the future of the market is up in the air. “We would love to call Newmarket our home. We bring a lot of footfall to the area and we think we have a harmonious relationship. Nadia Cassidy, the organiser of the Fusion Sundays market, says she is already looking for a different space and is not optimistic about remaining in the Newmarket area. The consensus, even among many the objections, is that local businesses and markets are not anti-development – but they also want to be part of Newmarket Square’s future. Boyle says the developers could learn a lesson from the manner in which the Teeling distillery’s owners has slotted into the neighbourhood. “How the Teelings have approached settling into the community and becoming part of the landscape is a real exemplar,” says Boyle. “They looked at using the local materials and idioms of the area. She adds that she has a lot of respect for the architects involved and that Creedon’s “heart is in the right place”, but the current design is just not the right fit for the area. Email “'It could be Dublin's Soho': Inside the row over the future of one market square”. Feedback on “'It could be Dublin's Soho': Inside the row over the future of one market square”.